Disclaimer: Resource guarding (commonly referred to as food aggression) is a serious behavior. If your dog exhibits any aggression or guarding that you’re uncomfortable with please seek the help of a professional. Resource guarding won’t just go away, and it tends to gets worse if not managed properly. If your dog has severe guarding issues (where they snap or growl at you) please seek out the help of a professional trainer or behaviorist. Does Your Dog Guard Their Food? Does your dog guard their food? Do they get stiff and uncomfortable when you approach their bowl? You’re not alone. Resource guarding is attributed to 44% of all dog bites to children under the age of 6. It’s not a fun behavior to manage, and in severe cases it’s a major liability. The advice in this article is only recommended for dogs with mild resource guarding. As I mentioned above I recommend seeking out the help of a professional if your dog’s guarding behavior is severe. What is Canine Resource Guarding? Resource guarding is when a dog tries to discourage the taking away of an item in their possession such as food or a toy. In mild cases a dog might stiffen up when you approach the guarded object, but in severe cases they may growl or even bite. 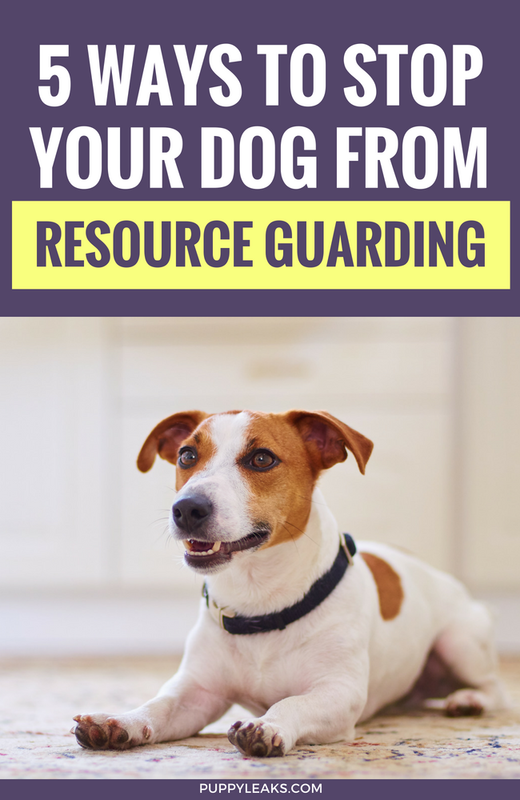 Tip: If you’re struggling with your own dog’s guarding I recommend reading Resource Guarding: Understanding the Behavior to help give you a better understanding of the behavior. It’s a behavior that’s often misunderstood, and once you understand why your dog is guarding it will be easier to manage. Dogs that guard their possessions are a risk, especially for children. It’s a serious behavioral issue that needs to be managed before it gets worse. If you aren’t comfortable around your dog when he guards don’t hesitate to call a professional trainer. They will work with you and your dog in a controlled environment to help you learn to manage the behavior. 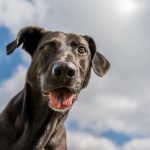 If your dog has a mild case of resource guarding the following tips will help. I’m going to focus on the methods that help prevent and reduce resource guarding around food. 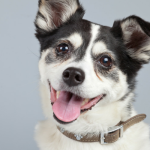 It’s the most common item dogs guard, but these methods will work for other items that your dog gets possessive of such as toys or other people. Resource guarding around food is the most common form of guarding (it’s often just called food aggression). Your dog is not being aggressive to spite you, dogs that guard their food are exhibiting fearful behaviors. Whether it makes sense to you or not they see you coming towards their food as a threat – and they’re going to exhibit behaviors to discourage you from getting to it. I’ve been through it a million times in my mind, and it still doesn’t make sense. I’ve never taken away my dogs food or acted in a threatening way towards her. Why does my dog think I’m going to take away her food? But the thing is I had to let that question go in order to manage it. I had to stop blaming myself, and I had to stop wondering why she felt that way and just deal with it. It is what it is – scientists believe it’s part genetic and part environmental. No one knows the exact reason some dogs guard and others don’t, but we do know that it’s a natural instinct left over from their wolf ancestors. So yes it’s frustrating, but we need to move past those negative feelings we have towards our dog when they guard. Your dogs behavior isn’t personal, it’s a fear based response. It’s not something you can fix by confronting your dog, not can you fix it by trying to become more dominant. Any harsh punishment for resource guarding will likely make their fear worse, and it increases the likelihood of your dog lashing out. So rather than worry about the causes for the behavior we need to focus on modifying it. Once we stop pondering over the reasons why our dog is guarding it’s easier to stick to the task at hand – managing the behavior. I’m hesitant to say cure because despite all the progress we’ve made it does come back. It’s not as serious as it was before, but every once in awhile my dog will get some new toy and start guarding again. Without some maintenance training from time to time dogs can revert back to full time guarding behaviors. Managing resource guarding is a long process, but if you’re consistent you’ll start to see results in a few days. It’s important to keep doing these methods even after you see improvements because resource guarding tends to pop back up without consistency. 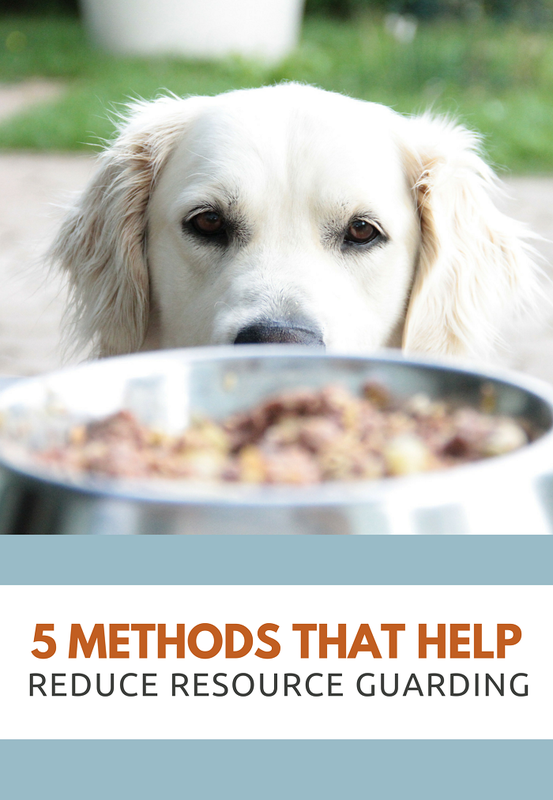 Here’s the 5 methods I used to reduce resource guarding in my dog around her food. 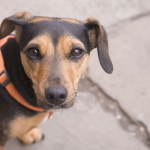 These methods can also be used for dogs that guard their toys, their bed, or other people. Every dog with resource guarding has a threshold. A certain point where they start to get uncomfortable when you come near their food. I think of it as an invisible line, and to keep making progress you need to make sure you’re not crossing it too fast. These methods will take patience on your part. It’s important to know where your dogs threshold is and take it slow when crossing that boundary. Prevention is a big part of managing resource guarding, and consistency is the most important part of modifying the behavior. Certain items such as food will trigger your dogs defenses, so it’s important to keep the environment as predictable as possible when training with a dog that guards. If something unexpected happens, such as another member of the family approaching your dog while eating, you can find yourself dealing with a dog that’s already above threshold to focus (too stressed out). Your ultimate goal is to change your dogs attitude when it comes to people approaching anything that triggers resource guarding, most often food & toys. It’s easy to lose momentum when you face setbacks. Every time your dog guards an object and nothing positive happens that behavior is reinforced. Keeping the environment predictable until you’re ready to train is an easy way to avoid setbacks. In my case I chose to work on Laika’s resource guarding when I was alone. I didn’t want anyone unexpectedly coming over and interrupting the process since she’s already stressed enough when it comes to food. Until you’re confident that the behavior has been modified it’s important to keep the environment controlled. When it comes to changing your dogs guarding behavior desensitization is key. Rather than punishing a dog for resource guarding you need to modify your dog’s feelings when it comes to people approaching their food. We want them to say “yay, good things are coming” as we approach their food rather then cowering in fear or lashing out. And the way you do that is by using counter conditioning and desensitization. Keep in mind desensitization can can be a long, tedious process depending on how severe your dogs guarding is, but it does work if you’re patient. The first step in changing your dogs attitude about how they feel when someone approaches their food is to always make it a positive experience for them. A few steps before reaching the point where your dog starts to guard or get defensive toss a treat towards them. While you have your dogs attention toss a few more treats their way while you’re at a safe distance & walk away. Repeat this step a few more times for the first few days while your dog is eating. When done regularly these desensitization exercises will start to change your dogs attitude when it comes to being approached while eating. They’ll start to associate you coming towards their food as a positive experience, rather than something to be afraid of. But keep in mind it takes time to change your dogs attitude towards something they’re afraid of, especially if it’s been going on a long time, and moving too fast can set back any progress you’ve made. Once you’re confident that your dog isn’t stressed out by you being a certain distance away from their food you can start to slowly get closer. With high value treats in hand approach your dogs food bowl while they’re eating, this time walking one step closer than in step 1. Toss a few treats their way from your new spot and walk away. After a few tosses you can take another step forward, slowly decreasing the distance between you and your dog. Repeat this step a few more times while they’re eating. If your dog stiffens up, growls or starts to show any signs of discomfort you’ll need to move back a step & toss treats from there. Remember where your dogs threshold is and only work on moving one step closer at a time. After enough practice you’ll find yourself getting closer & closer to your dog, and as long as you don’t push too fast you’ll eventually be able to get next to your dogs food bowl while they remain relaxed. It’s all about creating positive associations every time you come near their food. 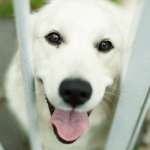 After awhile your dog will begin looking forward to you coming near, rather than getting defensive. Where do you feed your dog everyday? Is it in a corner or in a highly trafficked area? Sometimes the environment itself can cause extra stress for your dog. So if you’re trying to reduce resource guarding you’re going to need to take a look at what triggers it to begin with — and the environment itself is often a big factor. We used to keep my dog’s food bowl by the front door in a corner. I now realize that the location wasn’t ideal for a dog that’s stressed out about food. She couldn’t clearly see what was going on in the next room and it was in a pretty busy area of the home. A dog can feel cornered in certain areas, and there’s no doubt having my dogs dish sat back in a closed off corner attributed to that. Her guarding is under control now, but I decided to move her food bowl around to different locations to gauge her responses – and it was always worse in that original area so we’ve since moved it’s location. Some of it is because of the location itself, and some it’s because that’s where it was normal for her to get defensive since I didn’t know how to manage her guarding properly right away. If your dog has been resource guarding for a long time it’s a hard habit to break. A few times a week move their bowl to a new place & work on training there. It’s a simple way to change their mentality about meal time just by making it less predictable and giving it new associations. I’m a big fan of using food dispensing toys to feed my dog her dinner at least a couple times a week. I use both the Kong Wobbler & Bob a Lot treat dispenser because they’re tough & big enough to put a few cups (or more) of food in there. Using treat dispensers helps break up the routine and makes eating something my dog looks forward to. Our dogs get their meals for free, but their ancestorys used to have to work for all their meals, so using a toy gives them a simple job to do. I also like to hand feed my dog, though I will admit it’s not a cure for resource guarding. 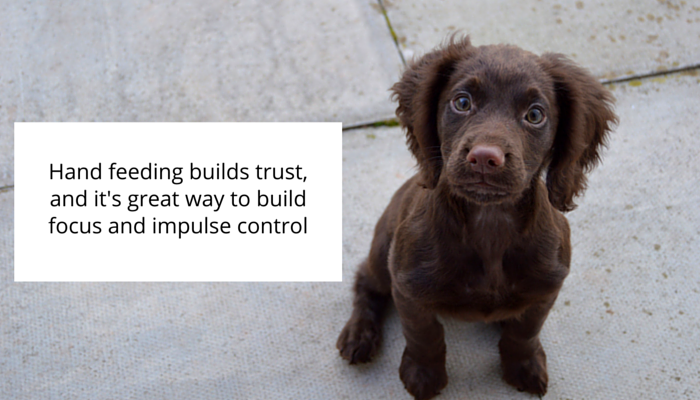 It helps build your dogs trust & confidence, and it’s a great way to work on some manners & impulse control. It’s a simple way to change up their feeding routine, and it’s helpful in teaching dogs that having people handle their food is a good (and not so scary) thing. Much like using desensitization with yummy treats you can initiate play in different areas around the food bowl to reduce resource guarding. If you start to play before you reach the point where your dog is uncomfortable it can change your dogs attitude instantly. I like to call it the moment where I “break my dogs brain,” that moment where she’d usually get mad but instead she’s overcome with playfulness. Just like when using food I’ll start to walk up to her with a tug toy or ball, making sure I’m paying attention to her body language. Before I get to the point that makes her uneasy I’ll offer the toy and ask if she wants to play – and if I haven’t crossed that threshold it always works. It’s not quite as effective as using food but I still use it regularly to keep up on the training. Ultimately you want your dog to be comfortable with people coming & going everywhere in the house, even near their food. Having different positive situations take place in that area will help them get used to the idea that good things happen over here, no need to get defensive. I’m not going to lie and say reducing resource guarding is easy — desensitization is a slow process. But trust me when I say it works wonders over time. Each day you’ll be able to get a little bit closer to your dogs food bowl without protest, and your dog will start to see you coming by as a good thing. 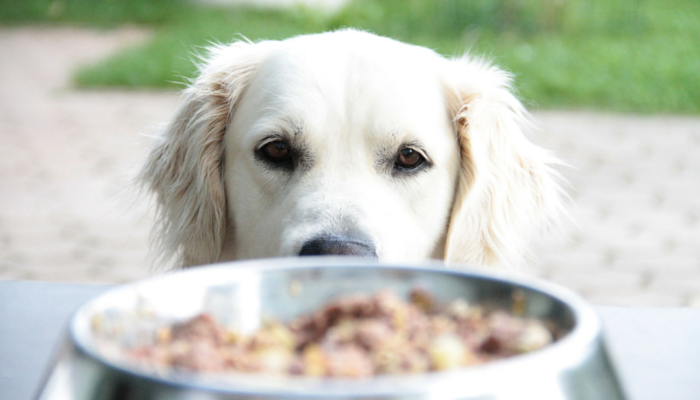 With patience and dedication you can manage your dogs aggression around food and reduce resource guarding. But remember to stay consistent and let the whole family know about the issues and risks of resource guarding before you begin. And make sure everyone is on the same page when it comes to the management techniques you’re using to avoid setbacks. Remember: If you’re uncomfortable because of your dogs guarding behaviors seek the help of a professional. Without help the behavior can get worse, and it becomes a risk to the whole family. Trainers can help teach you some methods & give you a management plan that will work for your dog. Great post, Jen! I’m sharing! When I was starting giving Cookie raw bones is always held them for her. For a number of reasons but preventing food guarding was one of them. When she first came to us she was concerned about having things taken away from her. I’d just go by and gave a treat. Then I’d go by, extend my hand toward her and gave a treat. Then touch the object. Then take the object, give treat and give the object back. Now, she very docile and all she did was to lower her chin over the object. But that told me she’s worried about having it taken from her. She is quite comfortable with people around her things now. It’s so rewarding seeing how that “yipee” attitude can come about in our dogs, isn’t it? To go from being fearful of having their stuff taken away to looking forward to us coming by is awesome. How do you do this if you feed in a kong and they pick it up and run off with it? We were told that just feeding a puppy in a bowl is a waste of kibble and to use feeding time as mental stimulation. I had a feeding problem before. I have two dogs, one was agressive and the other (a rescue) overly timid. There were dog fights. There was bowl agression with the kids just passing by. There was just a lot of drama at meal time. I feed them in the barn, in seprate bowls, but the aggresive one would go out of his way to be mean to anything or anyone. So what i started to do was make a routine while feeding. I call them both and make them sit and heel at the food bin. I get down and personal making each bowl of food, and setting it next to me. The dogs at my level while im doing this. They are not allowed to touch the bowl until i give my command. Its like iv established these are mine until i say otherwise. And then i give them eche, one at a time, their specific bowl in there specific place. I call them by name. Also i started putting treats or gravy in bowl while they eat. It also helps with impuls controll. And now they eat together and get along so much better.